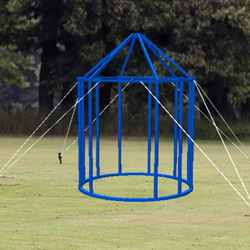 The work is based on designs for Astronomical Observation Tents used throughout the 18th Century on the Exploratory Voyages of Captain Cook whilst charting the East Coast of Australia and observing the transit of Venus. The original apparatus would have been ‘flat-packed’ to make best use of the storage space aboard ship – when assembled, the Astronomers and Cartographers accompanying Cook would have used the Tent as a ‘hub’ for charting the Southern Skies and Australia’s Coastline. Comprising; twelve wooden posts, two (composite) wooden rings and a conical roof made from further wooden slats, the open framework could divide the Night’s sky into sections (just like on a Planisphere) and become a tool in its own right. The colour of the object is taken from a hand-coloured engraving from about the same time, depicting a similar tent. I have chosen to omit the ‘Canvas covering’ from the work to expose the framework as depicted in some drawings made at the time. Christopher Hodson is an artist within whose practice disparate elements collide, allowing him to take on the role of; artist, scientist and alchemist. Aspects of; Space, technology, landscape, current & antiquated science, time and dimension are explored through a range of materials and processes allowing ideas to react and combine. The work takes on the form of sculpture, installation and video and is the resulting precipitate of experiments with materials, processes and contexts. Having graduated from MA Fine Art at the Birmingham Institute of Art and Design in September 2009 Hodson has been developing a practice based around the creation of both physical and virtual objects. Hodson’s sculptural works take many forms and is often the result of an idiosyncratic logic, creating physical assemblages which are comprised of various objects and materials which through their construction become what the artist describes as ‘active’ sculpture; objects which through certain combinations of materials become more than static forms. This may occur through chemical or physical reactions as in 40Mhz (2010) – whereby a collection of Lemon batteries in series power a low frequency radio transmitter in an attempt to connect two points within a landscape. For A Minute of Your Time (2007) the artist transformed a sixty inch tape measure by converting the units to seconds – questioning notions of dimensionality. Milky Way (2008), exhibited as part of the New Generation Arts Festival in Birmingham UK, saw the swirling mass of a galaxy appear to float atop the contents of a white coffee mug. Over the past four years the artist has exhibited in a number of high profile shows and self initiated projects including; Above and Beyond (Hanbury Hall, Worcestershire: Supported by The National Trust.) Roll Up Art (University of Architecture, Bucharest), Ctrl-Copy (Online) , Close Encounter (New Generation Arts Festival 2008, Birmingham UK) , Mission Control (PITT Project Space, Worcester UK) MECA (Malvern Exhibition of Contemporary Art) , 14°N 32°W (Online Project curated by Hodson) and more recently GONGOOZLER at Grand Union, Digbeth.